Baby boomer Michael Alan grew up listening to '70s and early ‘80s rock and pop. His musical obsession was and still is, The Beatles. In college, Michael was exposed to all types of jazz and fusion by teachers and fellow musicians. His interest in using computers to create music inspired him to work with synthesizers, MIDI and hard disk recording when the technology was still very new. Michael's healthy obsession with music technology sheds light on his debut album - DISTANT WORLDS - featuring plenty of synthesizers, loops, keyboards, drum samples, a smattering of real guitars played by Michael Alan, Michael Vince and Tony DePaolo and lots of saxophones, flute and EWI. "DISTANT WORLDS allowed me to bring all my musical skill sets – sound designer, musician, engineer and producer - into a single project that showcases my jazz, pop and rock influences and the many facets of who I am as an artist". Alan’s emergence caps a multi-faceted career in the music industry, which includes stints as a sound designer and tech consultant for numerous producers, recording artists and bands (including Toto), mixing and mastering engineer. 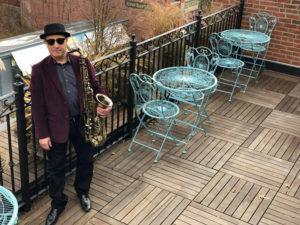 The Berklee alumnus is also a veteran of numerous jazz, rock, R&B and Latin music ensembles.